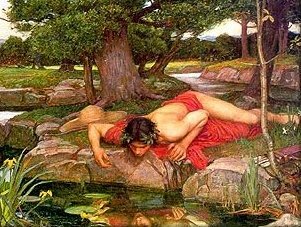 Narcissus or Narkissos means “sleep, numbness,” in Greek mythology was a hunter from the territory of Thespiae in Boeotia who was renowned for his beauty. He was exceptionally proud, in that he disdained those who loved him. Nemesis saw this and attracted Narcissus to a pool where he saw his own reflection in the waters and fell in love with it, not realizing it was merely an image. Unable to leave the beauty of his reflection, Narcissus died. We would be opening a new book of 366 pages and its pages are blank. This book is called Opportunity. Fill this book with complete joy and love for all we know and its first chapter begins with wishes ‘Happy New Year’. This was supposed to be a greeting to me but it greets the sender only and asking me to fill his year with joy and love. Amazing people! This entry was posted in Life, Philosophy & Religion. Bookmark the permalink.